When British starlet Kate Winslet finally scooped her first Oscar (on her sixth nomination) last year, it was for her portrayal of former SS guard Hanna Schmitz, a complex character originally penned by German judge-turned-author Bernhard Schlink. But while Schlink may be best-known in the English-speaking world as the author of THE READER (the first German book to ever hit #1 on the New York Times bestseller list), he is also an accomplished crime writer; the creator of an award-winning series of literary detective novels starring geriatric private eye Gerhard Self. In the fourth and latest (and reputedly, perhaps last) 'Self' tale, the 70-something year old private prosecutor turned investigator looks back, after fleeing his hospital bed, on how he was recently lured out of retirement by Welker, the mysterious head of the region's oldest private bank. A chance meeting had led to Welker having a seemingly simple request of Self: as part of a history of the bank, that is being compiled, could Self find out the identity of a secretive former silent partner, whose involvement dated back to the late 19th century? It seems routine, but as Self investigates, and comes face to face with his own and his country's dubious past, he begins to wonder whether his mission is just a ruse for something far more sinister. A frightened elderly man passes Self a money-filled briefcase, before killing himself by driving straight into a tree. Just how influential is Welker's hardnosed Russian sidekick? And was the hiking death of Welker's wife really an accident? Complicating matters, an annoying ex-Stasi agent from East Germany turns up on Self's doorstep, bizarrely proclaiming himself the detective's long lost (never known) son, and forcing Self to re-examine and relive the painful end to his marriage. Is this irritating new arrival who he really claims to be? Was Self's wife who he thought she was? Just like in his current 'routine' case, nothing is as it seems, and Self finds himself examining the truth about himself, while trying to uncover the truth about the enigmatic Welker and his simple request. The best thing about Schlink's storytelling is the character of Self - an affable and philosophising old man who's seen plenty - and the way Schlink touches on and questions aspects of German society and history. Like Hanna in THE READER, Self has a complicated past; after fighting in the invasion of Poland, he worked as a public prosecutor for the Nazis. The shame and guilt the 'old codger' has for his own and his country's past rears its head throughout SELF'S MURDER, as the deep-thinking detective is forced to confront how far they have both really come. Unfortunately the slowly-unfolding plot is more mildly interesting than gripping; a flaw that might prevent some readers fully enjoying the philosophical and cultural insights. Strangely, given the complex thematic and background questions that do arise, Schlink's writing is crisp but at times (especially early on) seems a little 'thin', straightforward (on-the-nose), or one-note. It's hard to tell whether layers of subtlety, meaning and depth may have been lost in translation. 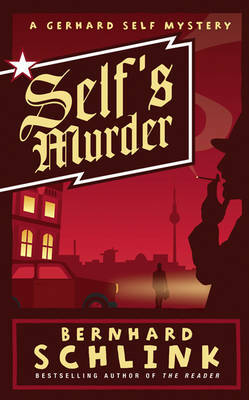 Given the 'big' questions and ideas touched on throughout, SELF'S MURDER could have been a great crime novel, if it had a better storytelling (e.g. page-turning) spine. In the end, I was left with the impression of a good tale, reasonably well told. Craig Sisterson is a New Zealand based writer and reviewer. He also regularly blogs on crime fiction news and issues at Crime Watch.